Marks Economy Series Grade 2 Cylindrical Leversets. Features a unique "clutch" mechanism that radically reduces the wear and abuse that typical cylindrical lever sets endure. The use of a clutch results in longer lasting, lower maintenance, eloquent solution. 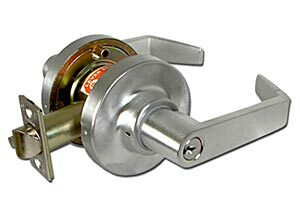 Storeroom Lock - Deadlocking latch by lever inside, key outside. Outside lever always locked. Cylinder: MARKS "C" keyway, 6 pin supplied with 2 keys standard.